1910, May 7 Enrolled Chicago; 1,374 gross/811 net tons. 1916 Owned Crosby Transportation Co., Milwaukee; sold same year Col. E. H. R. Green. 1917 Converted to yacht 247 x 41 x 16', 2,058 gross/1,122 net tons; cut in two, lengthened. 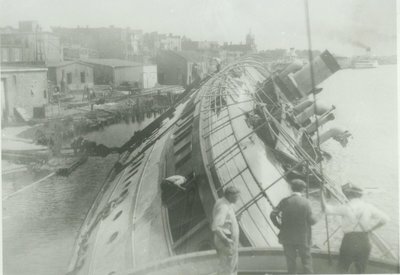 1919, Aug 21 Holed, sank Padanerum Harbor, South Dartmouth, MA. 1929 Rebuilt as freighter Lauzon, QUE; owned Canada Steamship Lines Ltd.Montreal, QUE; 246.66 x 40.16 x 16', 1,658 gross/823 net tons. 1937 Owned Manseau Shipyards Ltd., Sorel, QUE.